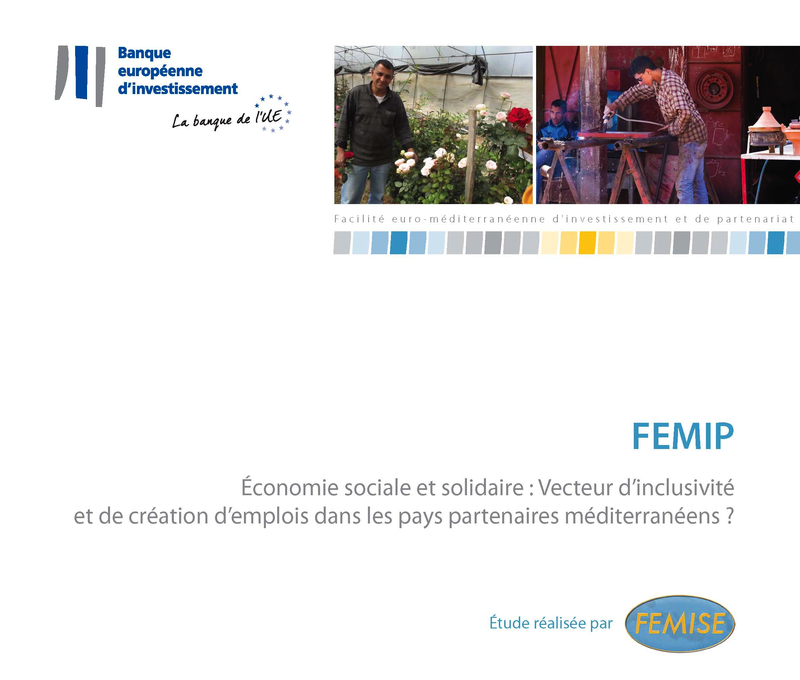 Femise > Publications > Thematic Report > Social and Solidarity Economy: a Driver for inclusiveness and job creation in the Mediterranean partner countries? Social and Solidarity Economy: a Driver for inclusiveness and job creation in the Mediterranean partner countries? Considered “an alternative route” to the traditional market economy, the aim of the social and solidarity economy (SSE) is to promote employability and inclusiveness. The latest thematic report published by FEMISE and financially supported by the EIB on : “Social and Solidarity Economy: a Driver for inclusiveness and job creation in the Mediterranean partner countries?” suggests the introduction of a regulatory framework and tax incentives for this promising sector of which the potential has not yet been sufficiently exploited. Why and in what way is the SSE important to the Mediterranean Partner Countries? In the Mediterranean Partner Countries, like in other regions of the world, means of development are challenged by the difficulties in generating employment, sharing the fruits of growth and ensuring that there is a “fair” distribution of economic progress, especially for young people or for certain regions. The result is the emergence of another way forward, dubbed the Social and Solidarity Economy (SSE). Although the SSE cannot address all these problem areas, it has the potential to become an important aspect of development policy in the Mediterranean Partner Countries. It is FEMISE’s view that the SSE opens the way to joint resolution of individual or social deadlock. To that end, the SSE has the features that could help it to become one of the tools for socio-economic innovation that the Mediterranean Partner Countries are calling for. First, the SSE allows excluded groups to be included in the economic process. When supported by an appropriate public policy, it can contribute to economic security across the full spectrum of population groups and to their autonomy. Second, the contribution made by the SSE can be decisive because it is based on regional development and proximity and advocates community participation while prioritising social impacts. Third, the SSE could address the lack of economic diversification. The SSE takes several forms and can be found in all sectors. Fourth, the SSE gives preference to local agriculture and allows a different approach to be taken to the relationship between an individual and food. Fifth, the blueprint and its principles of limited-profit enterprise make for low exposure to financial market dealings. Sixth, the SSE offers a response (including through the development of mutuals) to demographic issues and to the construction of solidarity within and across the generations. Finally, the fabric of SSE organisations (assembly, election, participation) is a training ground in participative values, in that it is part of an organised expression of citizenship and therefore of ownership of the institutional rules associated with it. Whilst it is difficult to identify a single, universally accepted SSE blueprint that could be “transposed” into the region; to our knowledge, no such blueprint exists. Nonetheless, there are instances of successful practices in some sectors along with mechanisms that could support and finance projects of high social and development impact worthy of consideration and support from national and international stakeholders. However, developing the SSE is a lengthy process, the sector cannot be transformed overnight and a long-term policy is necessary. This report has a twofold objective: (i) on the one hand, to give an overview of the SSE in the Mediterranean and identify potential and current bottlenecks and (ii) to put forward possible actions to develop the sector by suggesting possible operational tools that could be introduced, perhaps with support from international sources of funds. Following an introductory section, the study gives an overview of the current blueprint for the SSE in three countries (Morocco, Tunisia and Egypt), outlining the buoyant sectors, means of finance, legal framework and identifying the main obstacles to SSE development. The final section presents possible actions to support and develop the SSE in the Mediterranean Partner Countries, the options for intervention and successful practices that the Mediterranean Partner Countries could look to for inspiration. Part I: Why and in what way the ESS has an importance for the MP countries?